As the Maldives are only 1 hour's flight from Colombo, it makes an ideal extension to your holiday expecially if you are keen on diving or snorkling. 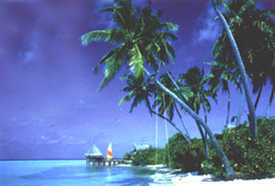 We can offer a two-island combination to include Sri Lanka and the magical Maldive Islands consisting of remote, romantic and stunningly beautiful small island hotels in the Ari and Kaafu Atolls on the Equator surrounded by the aquamarine coloured seas of the Indian Ocean - 400 miles south of India. With a choice of 12 Islands, some near some far from Male (the capital island), it is the perfect place for holiday makers and honeymooners alike with masses of sun, sea and sand. Seeing is believing. Gan is a 90 minute flight from Male and could not be more different from the Gan known to many as the staging post to other bases in the Far East. It is now joined to five other islands by causeways giving the opportunity for bicycle rides through local villages as well as diving, tennis, sailing and has a large pool and small beach.